So you got rid of cable (bravo fellow cord cutter), but now your media streaming player is still taking up space on a shelf below your TV. 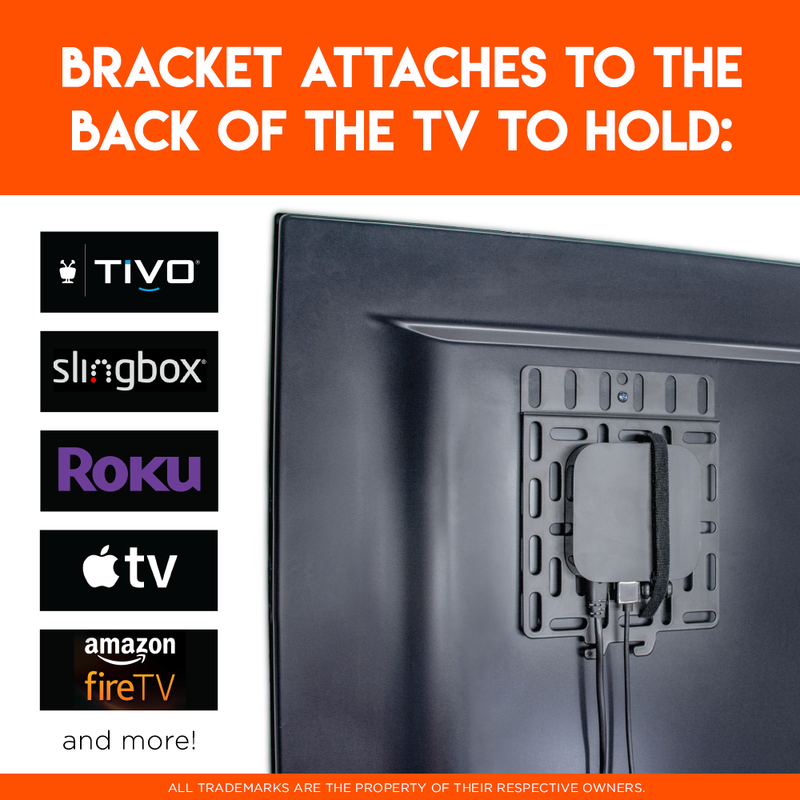 With the ECHOGEAR Streaming Media Player Mounting Bracket, you can simply and securely attach your device to the back of the TV out of sight. 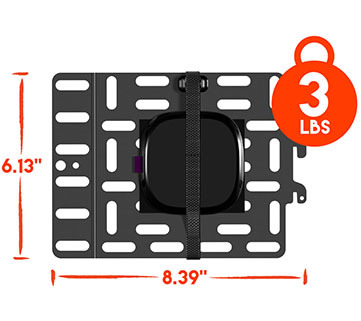 With a 3lb weight capacity and universal design, this mount can support almost any device. We support your decision… to hide your streaming devices…well, up to 3 lbs. That's more than enough for your Roku, Apple TV, Fire TV, and others. Did you think this was going to just float in space? 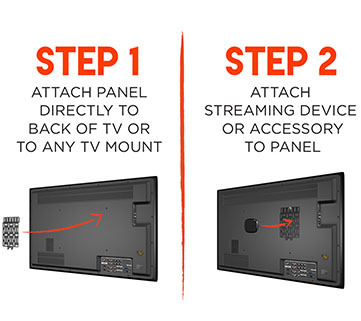 All hardware is included to attach panel to a TV or TV mount. We can work together to achieve a common goal. This media streaming player mounting bracket doesn't just work with all ECHOGEAR TV Mounts and Stands, but all TV mounts and TVs on the market. Back in the old days, you couldn’t hide your AV devices because remotes used an IR signal and needed line of sight to work. But now, with RF/Bluetooth technology, it is no longer necessary. That means you can put your device almost anywhere and have a cleaner TV setup. The best spot to put these devices? How about right on the back of the TV? That way, your HDMI cable will still reach, but nothing will take up shelf space. Imagine how classy your pad will be without all the devices and cables running all over the place. Some device mounts are specific to each model, ours is universal, so anything up to 3lbs (the new Apple TV is 15 oz) will work. So when you upgrade devices, you won’t need a new device mount. So how does it work? 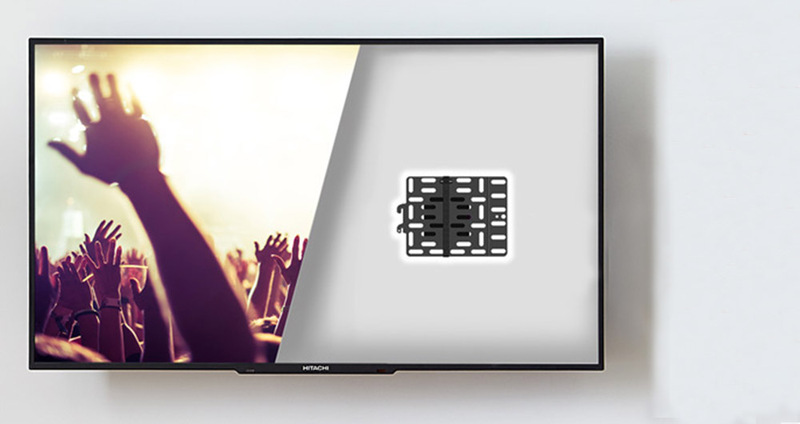 The Universal Media Streaming Player Mounting Bracket uses the same VESA holes as TV mounts, and will work weather you’ve mounted your TV or not. All you need is a screwdriver. "This is a great idea and has allowed me to hide the numerous internet connected gadgets that were popping up around my Flat Screen TV." -David F.
Click the button below to add the Universal Streaming Device Mounting Bracket to your wish list.